If you've ever lusted for a "one-coat wonder" product for your lips, your search ends here. Get a full-blooded burst of pigment with just a single swipe of the SUGAR Smudge Me Not Liquid Lipstick that will stay the day and right up till the night! Wine, coffee and date-proof - this is a matte lipstick that is guaranteed to last longer that your longest day. Available in 52 stunning shades that will make it difficult to choose - the question is, are you ready to commit to a lipstick that is built to last? Benefits: The SUGAR Smudge Me Not Liquid Lipstick gives you opaque pigmentation with a single swipe that stays all day with zero feathering or fading. This favourite mattifying fix contains a generous helping of vitamin E and comes in a full range of 52 gorgeous shades that is guaranteed to make your OOTDs stand out. About the Brand: Bring your sassy self everywhere you go with SUGAR cosmetics. This brand offers some statement-making and high performance makeup products that ensure that your style game is always on point! Offering products that aim to make you look your best, when you're on the move, SUGAR has already created a vast consumer base for itself. Explore the entire range of Liquid Lipstick available on Nykaa. 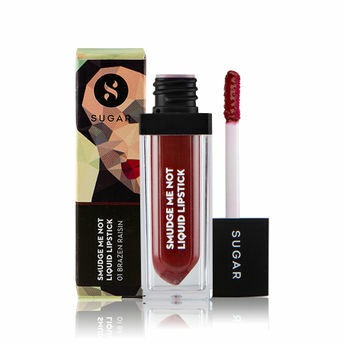 Shop more SUGAR products here.You can browse through the complete world of SUGAR Liquid Lipstick .Alternatively, you can also find many more products from the SUGAR Smudge Me Not Liquid Lipstick range.